Natives to Northern Wisconsin, my wife & I have lived in Niagara for 50 years. We started planting Christmas trees in 1989 (easy to remember because our first born son was only 6 months old). My wife, Brenda, asked Grandpa & Grandma Valerio if we could plant on their farm. We then bought the land and planted over 20,000 trees. In 1999, I built our Chalet for weekend stays. By this time, we were a family of five! With the help of our 3 sons – John, Michael & Joey, and many, many other family members, we started selling Christmas trees in 2000. 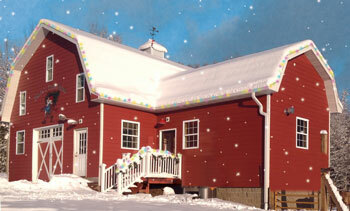 The Big Red Barn was built in 2005. In 2006, it was obvious we needed reindeer. And since then, we have had several born on our farm. As time went on, I knew I had to share my dream with other families! So, in 2010, we had our first Christmas Big Red Barn event. We have done some private parties for businesses and their families. To keep the timeline going, my boys and I built the Candy Shack the summer of 2011- what a great time! And lastly, from baking and frosting 200 sugar cookies, dipping caramel apples, having fresh bakery items - to grilling and serving...we are so very grateful to our families and friends for ALL their help! Your host, Pete Swanson, Niagara Wisconsin.